Tamara Pierre, a former Lynchburg village administrator, is shown in court at her sentencing hearing in January. Tamara Pierre, a former Lynchburg village administrator who pled guilty in January to stealing $14,000 from the village, will now have to pay more than $2,000 more due to an unrelated “miscalculation” in her separation pay in 2016, officials said. 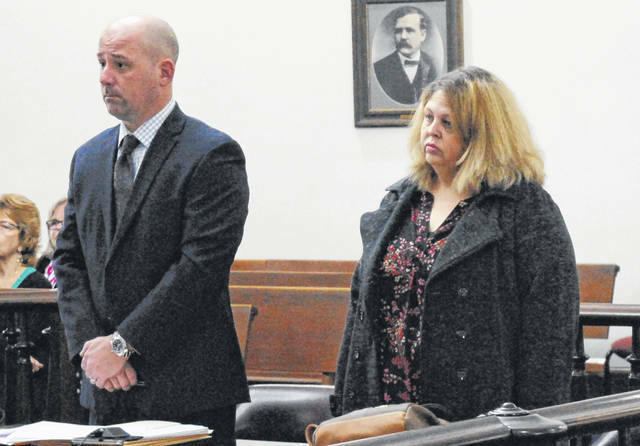 Pierre, 48, is currently serving a three-year term of community control sanctions for theft by deception, a fourth-degree felony, and has paid the village back in full for the money she stole, according to court documents. But the state auditor’s office says that Pierre now owes the village $2,215 because she was overpaid for 96 holiday leave hours to which she was not entitled. As a result, the state auditor’s office has issued a finding for recovery for public monies illegally expended against Pierre, Faber said. Lynchburg Mayor Terry Burden on Tuesday told The Times-Gazette that it was a “miscalculation” that led to Pierre’s overpayment. Burden said it was “not theft or anything like that,” and that the overpayment was not related to Pierre’s theft from the village. Burden said he did not know how soon Pierre would have to pay. As previously reported, Judge Rocky Coss in January sentenced Pierre to three years of community control sanctions and 30 days in jail, ordering her to pay the county back for the cost of her incarceration. Defense attorney J.D. Wagoner, who represented Pierre, said at the time that his client refinanced her home to pay full restitution to the village. As previously reported, Pierre pled guilty to theft by deception following allegations that she stole from the village during her employment there between 2013 and 2015. During Pierre’s sentencing hearing, she apologized to village officials and residents of the village. “I sincerely apologize for my actions,” she said. Burden, who was present at the hearing, had prepared a victim impact statement, but was never asked to speak. According to Burden’s statement, Pierre used the village’s Walmart and Lowe’s cards to purchase items for herself. “It involves stealing from each and every citizen that lives within the village,” he said in his statement. Burden said that Pierre admitted to destroying financial statements by burning them in her backyard, then forging new documents to replace those she burned.